Sacroiliac (SI) joint pain is quite common during pregnancy, but unfortunately, many women may not understand they have it, and could therefore engage in activities that worsen it. Fitness professionals can also play quite a significant role in mitigating or exacerbating the issue. Don’t miss the “red flag” that distinguishes SI joint pain from typical low back pain, and learn key strategies that can help you prevent, or minimize, this pain in your clients. SI Joint pain often manifests as pain in the posterior pelvic region, typically on one side. Often that pain is worsened by weight bearing activity, especially on one leg (like walking, stair climbing, taking an exercise class, etc). Clients may refer to it as “low back” pain, but if you have them point to where it hurts, and they point to their posterior pelvic region on one side, it is different. The pain can range from chronic and dull to sharp and shooting, sometimes radiating down the leg a bit. 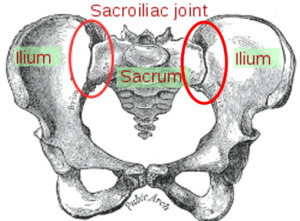 The SI Joint is located in the posterior pelvic region. One of the functions of the SI joint is to help resist the anterior pelvic tilt. However, its job becomes much more difficult during pregnancy, as the growing belly pulls the body further into anterior tilt (forcing the SI joint to work harder), while the pregnancy hormone relaxin softens the ligaments that hold the SI joint together, making it weaker and less stable. Often the weight of the belly tipping forward, combined with the softening effect from relaxin, becomes too much and causes the SI joint to give, stretch, and possibly become hypermobile. Coach her into neutral alignment: Help her counteract the anterior pelvic tilt. Neutral alignment is critical to relieving the stress on the SI joint. Strengthen the Core Canister and glutes: The greater the instability in the pelvic region, the greater the risk of experiencing SI joint pain or dysfunction. Therefore, one of the keys to prevent SI joint issues is to strengthen the muscles surrounding the pelvis to provide increased stability – specifically the Core Canister and Glutes. Be careful with unilateral lower body movements: To help prevent SI joint pain, be very careful with unilateral lower body movements. Lunges can be highly beneficial movements during pregnancy, but follow the proper progression in teaching them to ensure your client develops good control through the entire ROM before progressing. We recommend beginning with split squats, then moving to reverse lunges, then a side lunge (or side lunge slide if that’s too challenging), then perhaps a walking lunge or rotational lunge. Forward lunges are by far the most difficult (to do properly). Also, avoid quick, jerky, ballistic movements performed on one leg (skaters, jump lunges, etc). If the client is already experiencing symptoms of SI joint pain, then unilateral lower body movements should be AVOIDED altogether. Stick with bilateral lower body movements, like squats, bridges, deadlifts (if comfortable and performed properly). Teach proper SEATED alignment: Remember that sitting cross-legged or on one knee can wreak havoc on pelvic alignment. Encourage clients to sit up tall with both feet flat on the floor. This takes some getting used to for many women! Watch certain cardio machines: If a woman is experiencing SI joint pain, she may want to avoid traditional cardio machines, like the Elliptical, Stair Climber, or even running/power walking on a treadmill. Cycling could be ok, but recumbent bikes are a much better choice. Have her pay attention to the activities that cause pain, and avoid them. Note that sometimes the pain may not appear until the next day. Consider a pelvic support belt: These can often provide a great deal of relief. They are pulled on (similar to underwear) and help to stabilize the pelvic region. They can be worn at all times during the day, including during exercise, and are widely available online. However, sometimes these can feel uncomfortable if the SI joint is out of alignment, so let comfort be the guide here. Try using ice: SI joint pain responds well to ice, so try this strategy vs. applying heat. If pain is severe, refer to a physiatrist (or her doctor): SI joint pain can often be a transient issue. In other words, it’s really bad for a few weeks, and then completely goes away. So, upon first feeling the pain, you can try all the tips above. If pain continues for several weeks, or becomes severe, we typically recommend referring the client to a physiatrist. This is a medical doctor who specializes in non-surgical pain rehabilitation. The physiatrist can provide a formal diagnosis and develop the best treatment plan for your client, which could include physical therapy. If you do not know a physiatrist in the area, then have your client speak with her doctor to get an appropriate referral.